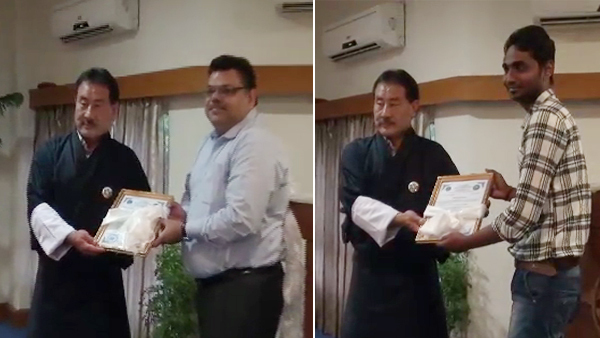 Zimdra Food Private Limited and Namgay Artisanal Brewery received the “Food Safety License” from Bhutan Agriculture and Food Regulatory Authority (BAFRA). The two private companies are first recipients of such a license from the government. BAFRA said the license was awarded to the two companies since they have good manufacturing and hygiene practices. The food safety licenses were given to the two companies in Phuentshogling yesterday. Zimdra Food Privated Limited produces juices and milk products and Namgay Artisanal Brewery as its name suggest is a beer company. While receiving the license, the Deputy Manager of Zimdra Food Private Limited, Jaideep Dutta said the company regards producing safe and clean edible products of utmost importance. However, BAFRA officials pointed out that the Food Act of Bhutan, 2005 requires all the food companies to apply for food safety license so that they could inspect and provide the license if companies are found making products that are consumer friendly.